Dariush Mehrjui, born in 1939, is to a certain extent the dean of modern Iranian filmmaking. He studied filmmaking at UCLA and returned to Ira n to make Gaav (The Cow, 1969), a groundbreaking and symbolic film set in the Iranian rural region, which was received in the West with great acclaim. Since then he has somehow managed to continue making occasional films despite extreme difficulties with Iranian government interference. I have been told that Mehrjui relies on the support of his enthusiastic supporters, mostly students, who deposit money into his bank account so that he can complete his films. Ali Santouri (also known as Santouri, Santoori, and The Music Man), his most recent film, was completed in 2007 and has been released in the West, but banned in Iran. The film is set in modern Iran and concerns the difficulties of a famous Iranian santour player. The santour is a classical Iranian instrument, somewhat like a zither, and it is used in contemporary pop music, as well as for classical Iranian music. The story covers the life of a popular santour player, mostly in flashbacks, and how his life fell apart due to drug addiction. It is worth remarking that in the Iranian drug culture “playing the santour” is a phrase used for shooting heroin. The time sequencing of the events presented on screen (the syuzhet) is rather complicated, since there are flashbacks within flashbacks, but the viewer is provided with enough cues to be more or less able to figure out where the depicted events are situated in the story. The basic plot covers the life of a young man from a very wealthy, but traditional, family who has become an Iranian pop star through his santour playing. He meets, falls in love with and marries a beautiful young woman who is also an accomplished pianist. But his traditional family has demanded that he give up music and disowns him, and ultimately the government bans his music from public venues. Thereafter he can only perform at private functions to make a living, and when he does so he is often recompensed with alcohol and drugs instead of money. To make ends meet, his financial difficulties must be partially met by his wife giving piano performances, and soon her participation in these activities leads to her personal involvement with a violinist. Eventually the santour player sinks further into withdrawal, becomes violent with his wife (who then leaves home), and ultimately he find himself on the street as a homeless heroin junkie. At the end of the movie, a chance encounter with his estranged wife (who is now remarried) leads to his rescue from imminent death and offers a path to physical rehabilitation. He winds up a somewhat sad and shattered man, giving performances and teaching music inside the medical asylum where he had been committed. The narrative line (the fabula) is essentially a one-way ticket to hell and downhill every step of the way. In particular, the continuous descent into ever-more-depressing drug addiction occupies much of the film and tends to weigh things down with gloom. The use of flashbacks provides some relief, though, because the santouri keeps reflecting on his earlier happy days with his wife. In these flashbacks the viewer is treated to extensive music performances, and these occasions are mostly joyous celebrations of love and music. In fact these sequences have a distinctly Bollywood flavour, and one is led to wonder what influence Indian cinema may have on the Iranian film scene. Because of the difficulties of filmmaking in Iran, one marvels at the lengths to which filmmakers must go in order to complete their films. Santouri is shot mostly with handheld cameras, and one can’t be unaware of various seams in the filmmaking production values throughout the film. For example jump-cuts are frequent, and these are not there for artistic effect, but are more likely in place due to constraints in the production. In addition, the concert scenes are marred by a multimedia overlay of green-coloured lines that bounce around the screen in rhythm with the santour playing. This effect is an utter failure and serves only as an annoyance to one’s enjoyment of the film. 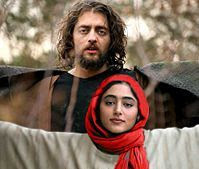 Nevertheless the acting on the part of the two leading actors, Golshifteh Farahani (Boutique , Bab'Aziz , and Halfmoon ) and Bahram Radan, both of whom are stars of the Iranian cinema scene, is extraordinary. One of the successes of the film is certainly the achieved chemistry between the two leads, who manage to convey an electric relationship while still operating within the strict constraints of government-imposed rules on behavior. Overall, the film leaves me with the sense of a failed masterpiece. The long, gritty descent into drug addiction is perhaps too relentless, and some of the jump cuts jerk the viewer out of his or her involvement in the story. Still, there is something rather deliriously brilliant about both the joyous intensity of the music and the graphically depressing fall into addiction. Music expression, which is generally frowned on in traditional Iran, is depicted here as a savior, as an outlet of artistic expression in general, and this is conveyed in a romantic expressionistic way that lingers in the mind long after the film is over. I have seen this expressionistic tendency in two other Mehrjui films, Gaav and The Cycle, and it is the mark of most of the great films. This is why we go to the cinema.